Yes! 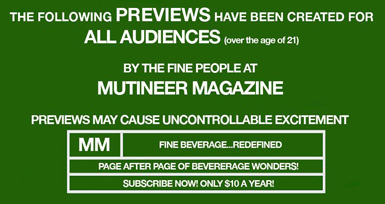 It is that time again, Mutineer Magazine Issue #3 is on the cusp of the brink of completion. There is zinfandel running through our veins and Captain Morgan on our breath. We just came from a meeting about taking the magazine national into grocery stores, bookstores and newsstands. Wine Mutineer Alan Kropf sat down with the host of Wine Library TV to talk about wine, the future and the NFL. Beer Mutineer JJ Bagley examines the age-old question of whether you should enjoy your beer from bottle or draft. Check out a lot of the blogs that were at the recent Wine Bloggers Conference. We ask ten burning questions about aphrodisiacs to “Fork Me, Spoon Me” author Amy Reiley. I can’t wait to get it! The aphrodisiacs article sounds great! Thanks, we’re pretty psyched about it too! Amy Reilly is HOT!, such a babe, but she’s no Gary Vaynerchuk. Wowser! When is the Steve Heimoff interview being published? Maybe have Gary and Steve in the same interview and they can both Vaynerchuk-off. Seriously, Alan, nice work. Let me know if you need a North Coast Correspondent. Or a fact-checker with Amy on how those aphros work… I can dream, can’t I?